The performance begins at 8:00; doors open 30 minutes prior. Online sales end at 6PM day of the show. Tickets available at the door at $20/each unless sold out. 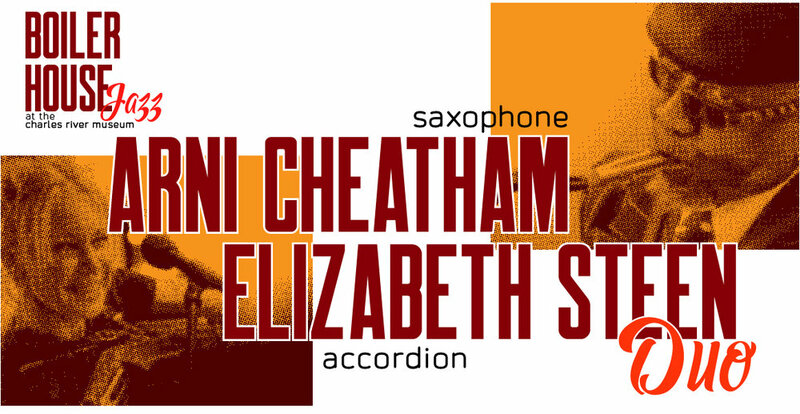 Saxophonist Arni Cheatham is a Boston area legend, and this unlikely but very intriguing pairing with keyboardist/accordionist Elizabeth Steen (Julaiana Hatfield, Tanya Donelly, Natalie Merchant) should prove to be a revelation, taking both of their styles to an entirely new level. Saxophonist, bandleader, educator, master teacher/performer, community activist, and photographer Arni Cheatham was the recipient of the 2013 Boston Jazz Hero Award by the Jazz Journalists Association and the 2015 Community Catalyst Award by the MPDC-Hibernian Hall. These awards acknowledged his long term dedication to bringing Jazz Education to children. As a musician, Arni has been a stellar musical presence in the Boston scene. His own ensembles – Thing and Search, and currently Smoke and Synergy – have always demonstrated the highest level of musicality, adventure, and exploration while honoring the widest sense of the jazz tradition. As lead alto for the Aardvark Jazz Orchestra, a Boston institution now in its 46th year, Arni has been one of the anchors and soul-stirrers from the beginning. He is also a member of that other fabulous big band, the Makanda Project, which performs the music of “Makanda” Ken McIntyre, and he has made guest appearances with the many national as well as local Jazz artists. Arni can be heard on various recordings under his own name and 14 albums with the Aardvark Jazz Orchestra. His most recent recording is entitled “Telecoustic”. Finally, Arni is also an accomplished photographer. He exhibits frequently; his work is in the permanent collection of the Boston Athenaeum and many private collections. He specializes in photographing nature, birds, landscape, and of course, local jazz artists. Elizabeth Steen is a multi-keyboardist, accordionist, and singer/songwriter who grew up in Pennsylvania, where she soloed with the Pittsburgh Symphony at age 16. After receiving a Masters of Music degree from the University of Michigan in Classical Piano Performance, Elizabeth moved to Boston to immerse herself in the music scene, and quickly became active in a far-reaching range of bands, from surf to electronic rock, including Juliana Hatfield, Tanya Donelly (Throwing Muses, Belly,) and Natalie Merchant, with whom she toured and recorded for many years. Her first recording as an accordionist was on the Billy Bragg/ Wilco project “Mermaid Avenue,” and she has shared the stage with luminaries Bonnie Raitt and Bob Dylan, among others. In between her touring and performing, she taught classroom music in the Boston Public Schools for 15 years, bringing music of many cultures to students throughout the city, and currently maintains a full studio of piano students. She has recorded two CDs of original works, and is currently working on a third, with her new project, Famous Grouse. She continues to collaborate on many projects, in the studio and onstage. 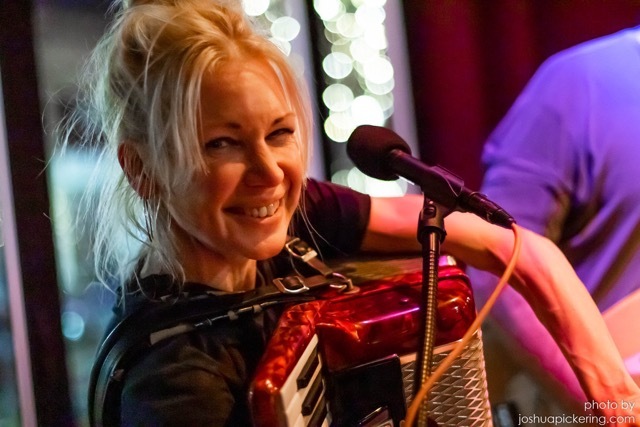 Her accordion repertoire spans music of many cultures and genres including swing, French, Balkan, Irish, Latin, Americana, Zydeco, polka, and rock n roll, and she finds an ever-flowing inspiration in music from anywhere and everywhere.